Sitting in the cafe of Chalk Farm's Roundhouse theatre, waiting to meet Philip Jeck, I start to go over in my head the previous night's performance. Jeck and the fifteen-plus members of the Gavin Bryars Ensemble had teased out a stirring requiem to the band that supposedly kept on playing on the decks of the sinking Titanic. It was a new re-working of a semi-aleatoric composition by Bryars, first written forty years ago. The strains of the band's final hymn, 'Autumn', subjected to the distortions of memory and underwater submersion, were as mesmerising as they were elegaic. It is this quality to Jeck's music that is perhaps most often picked up by critics. David Toop has talked of the inexpicably mournful character of Jeck's work, while Mark Fisher has used the concept of 'hauntology' (from the work of French philosopher Jacques Derrida) to explain its eerie nostalgia and uncanny sense of loss. Jeck himself claims to have little time for analysis: "Once I've made a CD or played a concert and that has gone out into the world, anyone can place it in their own view or understanding of music, sound or the world. And that is interesting to me — but what it sounds like is paramount." Having grauated from Dartington School of Art, Jeck spent the early 80s DJing at clubs and parties and using the same tools to make increasingly experimental music away from the dancefloor. His work first gained widespread recognition when his piece, Vinyl Requiem, a work for 180 Dansette record players, won the Time Out Performance Award in 1993. Since then he has honed his aesthetic through a series of albums, mostly for the Touch label, exploring the spectral resonances and emotional intensities to be drawn from old vinyl. In addition he has worked variously in collaboration with choreographers such as Laurie Booth and Steve Paxton, and sound artists Janek Schaeffer and Jacob Kirkegaard. Though not alone in using turntables to make an experimental music divorced from the rapid-fire cuts and scratches of hip-hop DJs, Jeck's music is immediately recognisable for its quaking, drifting sonorities; its vast, oceanic textures and swirling temporal disorientation; and its strange emotional pull. Phiip Jeck never did show up to meet me at the Roundhouse Cafe. He did, however, answer a few questions via email. What first drew you to this piece of music, The Sinking of the Titanic? 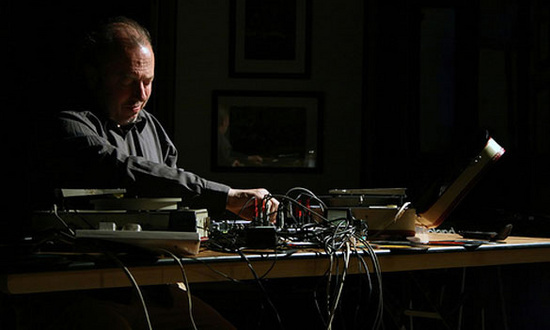 Philip Jeck: "I was originally asked by Alter Ego, a group based in Italy, to take part in a new version of The Sinking. . . for the Venice Bienalle. I've had a recording of the first version for a long time. Like my own work, it has at heart a strong emotional pull and I knew it was something that I could fit into well." PJ: "Liverpool is a vibrant city, not without its problems and drawbacks, but I think a good place to live and make work. Each place has its effect. I think I am infuenced in some way by everything I see or hear, from Eastenders to an exhibition at the Tate here in Liverpool." Have you ever been a hip hop fan? PJ: "I liked Grandmaster Flash and some hip-hop I hear now. In the late 70s — early 80s, the people I was really interested in were mixers like Walter Gibbons, Larry Levan, Shep Pettibone, especially Walter Gibbons. I would search out any mixes on 12" records by him and it was Gibbons who led me on to discover Arthur Russell as he mixed some of his songs. I still listen to these records, I especially enjoy the 'rough' quality that Walter Gibbons mixes have." How would you characterise the distance between your work and that of other composers who use turntables, such as Christian Marclay, or Otomo Yoshihide? PJ: "Christian Marclay was an early influence on my work, not so much in his way of playing but in that it opened up my way of thinking about playing, that so much was possible using record players, that it must be possible to find my own voice /language. Otomo Yoshihide I have played with in duets and trios several times, his approach is his own. As each guitar player might be different, so are turntable players different in the way they play." What led you into exploring the crackle of old vinyl? PJ: "The records I use are all from junk shops and come in various states of distress. I don't think I set out deliberately to use the crackle but it is a mark of their histories and an interesting sound to use as much as the recorded music in the grooves: it's what's there." Where do you find your source materials? PJ: "Mostly from charity or junk shops and, in the past, car boot sales. But I rarely look out for any records now — I have boxes of them at home that I've not even listened to yet. There's probably enough material to last longer than my lifetime. I have two collections, one I look after carefully and the one I work with which is is in the aforesaid boxes in my workroom at home. I also get given records by friends or sometimes at concerts by audience members." What is it about certain records that attracts you to them? PJ: "I think I can usually find something interesting to me in just about any record, it may only be one revolution of it but that's ok. The way I play is to listen out for some sound or combination that will emotionally affect me and then to try to expand on that, or to pare down the sound to keep the same impact with as little as possible." How would you describe the relationship between music and fine art in your work? PJ: "I think it's close. Music has always been the art form that moves me and interests me the most, but if I had any natural talent it was in visual art. I only finally came to working with sound/music through DJing, then on to using records and record players outside the dance club. Maybe the way I construct soundscapes comes from the visual training." What do you have planned next? Any plans for more performances of other composed (if aleatoric) works like The Sinking of The Titanic? It occurred to me that you could do a version of Terry Riley's In C, using loads of records of previous performances of In C as the 'instruments'. . .
PJ: "I am trying out a remix come re-working of Suite [Jeck's 2007 album on Touch] to see what might happen. A couple of pieces have resulted so far that I like. I hadn't thought about In C but, of course, it's possible. . ."